Learn to Skate Registration ongoing! The session started Oct 11, but we will have another session starting in January! Note: All lessons are at the Memorial Center. to get all Canadians on the ice. Borrow speed skates from us, or bring your own skates and helmet. Season 2017-2018 is fast approaching! The Rapids are looking forward to a fun season start with some fantastic events! Please contact us for more information, and also check out the Facebook page, it gets updated a little more quickly! Wednesday, Sept 6 – Registration at Memorial Center. 5 pm for pre-registered returning skaters, 6:30 for new skaters and learn to skate. 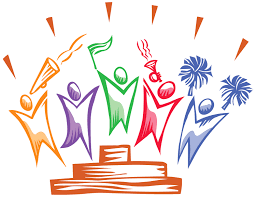 Sunday Sept 10 – Season start – all groups! Sept 16, 17 – Technical Seminar with Alphonse Ouimette! See FB page for registration info or contact us! 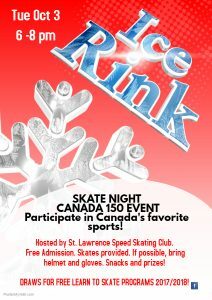 Tuesday Oct 3 – Canada 150 Community Event – come participate in the wonderful sport of skating and check it off your activity list for Canada 150 Participaction Action! Membership draws for some of our programs will happen that night! 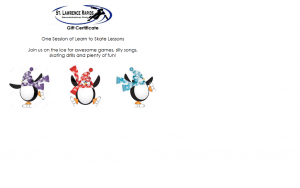 Learn to Skate Session #2 – Holiday Gift!!! Our skaters have been busy enjoying the competitive season. The next regional meet (#2) is coming up in Belleville. The club members are staying at a hotel for a social and swim the night before, so ask the coaches if you are interested. Registration by paper form to Heather by Nov. 30. The webmaster has relied on Facebook communication a bit, but wanted to catch up here and acknowledge that our skaters have participated in pre-season meets (Ottawa, Kitchener) , Provincial Series Meet #1 (Cambridge), Regional Series Meet #1 (Kingston) and a Long track camp and competition in Ste. Foy. A great start to the season, with excellent personal best times and placements. So very proud of all the skaters. Good Luck to skaters Andrew, Emma, Cameron, Nolan and Julia, who will compete this weekend in Gloucester for Provincial Series #2. Just a reminder that skating is cancelled Sunday November 27th. Some of our skaters took advantage of the “open” nature of the pre-season meets and went to the Kitchener Pre-Season Open Meet. Andrew – finished 5th in his division. Nolan Roney – finished 4th in his division. Cameron MacKay – 15th in his division. All three racers had personal bests (PB’s) over the 2 day meet – Great Job! The Ottawa Meet is a pre-season meet, 2 days long, for racers of all ages. The provincial and regional skaters are mixed together, and can be a fun start to the season. Registration is ONLINE, meaning you have to register with the online system yourself, as the club is not submitting registration forms. Payment, however, is by club. Not sure about racing? There will be many more competitions, and some fun 1 day ones, that the coaches might suggest to try later on if this is your first meet. Come out an watch if you can! For all the seasoned racers, this is a great meet to get our feet wet! The registration link is here! Gavin of ZT sports has a webpage where you can see pricing and pictures of speed skating gear! Please feel free to place an order with Gavin via phone/email/ web page. He can ship for a fee, which he will quote you, or you can ask when Jen is heading to Ottawa again, and I would be happy to pickup your shipment. This way, you arrange payment directly with Gavin. This may make selecting your gear more fun, and not depend so heavily on Jen’s memory! What equipment do I need? Sharpening – how? Check out the Tab “Skaters Corner”and “Equipment”. I’m showing off my artistic skills, and provided some references. Please ask any coach or Gerald if you have any questions. Remember – skating safety equipment tends to last the skaters a number of years. Expect up to 3 years on a skin suit, and up to 6 years on most of the safety items! Take good care of them, label them well, and your costs remain quite low. Also a reminder that skates need sharpening regularly to make skating fun and keep it safe. 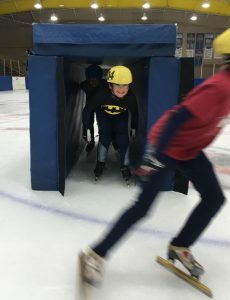 Once a month for our youth skaters is Coach Jen’s recommendation! Mid October, here we come! Recall! The club has sharpening kits that you can use at the rink and we’re happy to teach you how.